From the Cat’s Eye to the Eskimo, planetary nebulae are arguably among the most dazzling objects in the Universe. These misnamed stellar remnants are created when the outer layers of a dying star blows off and expands into space. However, they can look radically different from one another, revealing complicated histories and structures. But recently, astronomers have argued that some of the most exotic shapes are the result of not one, but two stars at the center. It is the interaction between the progenitor star and a binary companion that shapes the resulting planetary nebula. The archetypal planetary nebula is spherical. Most planetary nebulae, however, have been shown to be non-spherical, complex structures. “LoTr 1 is one such planetary nebula, but with a twist,” Amy Tyndall – a graduate student at the University of Manchester and lead author on the study – told Universe Today. It has not one star at its center but two. The binary central star system consists of a faint, hot white dwarf and a cool companion – a rapidly rotating giant. LoTr 1 with a binary central star system and two slightly elongated shells, with ages of 17 and 35 thousand years. Credit: Tyndal et al. LoTr 1 was first discovered by astronomers using the 1.2 meter telescope at the Royal Observatory in Edinburgh, Scotland. At the time it seemed that LoTr 1 was similar to a particular group of 4 planetary nebulae (Abell 35, Abell 70, WeBo 1 and LoTr 5), all of which had a central binary star system. Another common factor amongst this particular group is that in most cases the companion star seemed to be a barium star – a cool giant that shows relatively large amounts of barium. Before the planetary nebula forms, the progenitor star dredges up an excess amount of Barium on its surface. It then releases a Barium-enriched stellar wind, which falls on its companion star. “After the stellar envelope is ejected to form the surrounding nebula, the giant star evolves into a white dwarf, while the contaminated star retains the barium from the wind as it continues to evolve to form a Barium star,” explains Tyndall. Tyndall and her collaborates set out to see if the companion star within LoTr 1 was in fact a Barium star. They acquired data from telescopes in both Chile and Australia and compared their results to the two other elusive planetary nebulae in the group: Abell 70 and WeBo 1. “If barium is indeed present, it would be a good step further towards our understanding of how mass is transferred between stars in a binary system, and how that subsequently affects the formation and morphology of planetary nebulae,” says Tyndall. While the results show that LoTr 1 does consist of binary star system, the companion star is not a Barium star. But a null result is still a result. “LoTr 1 remains an interesting object to us as it shows that we still have huge gaps in our knowledge as to how these stunning objects form,” Tyndall told Universe Today. Without the presence of Barium, it would appear at first that little mass was transferred to the companion star. However, the companion star is rotating rapidly, which is a direct consequence of mass transfer. The most plausible explanation is that the mass was transferred before the barium could be dredged up to the stellar surface. If the stellar evolution was cut short this way then there will be detectable evidence in the properties of the white dwarf. The next step will be to take another look at this odd planetary nebula in hopes of better understanding the complexities of this system. The paper has been accepted for publication in the Monthly Notices of the Royal Astronomical Society and is available for download here. The incredible visual appearance of planetary nebulae are some of the most studied and observed of deep space objects. However, these enigmatic clouds of gas have defied explanation as to their shapes and astronomers are seeking answers. Thanks to a new discovery made by an international team of scientists from Sweden, Germany and Austria, we have now observed a jet of high-energy particles in the process of being ejected from an expiring star. When a sun-like star reaches the end of its life, it begins to shed itself of its outer layers. These layers blossom into space at speeds of a few kilometers per second, forming a variety of shapes and sizes – yet we know little about what causes their ultimate appearance. Now astronomers are taking a close look at a rather normal star that has reached the end of its life and is beginning to form a planetary nebula. Cataloged as IRAS 15445-5449, this stellar study resides 230,000 light years away in the constellation of Triangulum Australe (the Southern Triangle). Through the use of the CSIRO Australia Telescope Compact Array, a compliment of six 22-meter radio telescopes in New South Wales, Australia, researchers have found what may be the answer to this mystery… high-speed magnetic jets. “In our data we found the clear signature of a narrow and extremely energetic jet of a type which has never been seen before in an old, Sun-like star,” says Andrés Pérez Sánchez, graduate student in astronomy at Bonn University, who led the study. How does a radio telescope aid researchers in an optical study? In this case the radio waves emitted by the dying star are compatible with the trademark high-energy particles they are expected to produce. These “spouts” of particles travel at nearly the speed of light and coincident jets are also known to emanate from other astronomical objects that range from newborn stars to supermassive black holes. Will these high-energy particles contained within the jet eventually craft the planetary nebula into an ethereal beauty? According to the astronomers, the current state of IRAS 15445-5449 is probably a short-lived phenomenon and nothing more than an intense and dramatic phase in its life… One we’re lucky to have observed. “The radio signal from the jet varies in a way that means that it may only last a few decades. Over the course of just a few hundred years the jet can determine how the nebula will look when it finally gets lit up by the star,” says team member Jessica Chapman, astronomer at CSIRO in Sydney, Australia. Will our Sun also follow suit? Right now the answer is unclear. There may be more to this radio picture than meets the ear. However, rest assured that this new information is being heard and might well become the target of additional radio studies. Considering the life of a planetary nebula is generally expected to last few tens of thousands of years, this is a unique opportunity for astronomers to observe what might be a transient occurrence. “The star may have an unseen companion – another star or large planet — that helps create the jet. With the help of other front-line radio telescopes, like ALMA, and future facilities like the Square Kilometre Array (SKA), we’ll be able to find out just which stars create jets like this one, and how they do it,” says Andrés Pérez Sánchez. Located on Cerro Paranal in the Atacama Desert of northern Chile, the ESO’s Very Large Telescope was busy using the FORS instrument (FOcal Reducer Spectrograph) to achieve one of the most detailed observations ever taken off a lonely, green planetary nebula – IC 1295. Exposures taken through three different filters which enhanced blue light, visible green light, and red light were melded together to make this 3300 light year distant object come alive. Located in the constellation of Scutum, this jewel in the “Shield” is a miniscule star that’s at the end of its life. Much like our Sun will eventually become, this white dwarf star is softly shedding its outer layers, like an unfolding flower in space. It will continue this process for a few tens of thousands of years, before it ends, but until then IC 1295 will remain something of an enigma. Why is this common deep space object like IC 1295 such a mystery? Blame it on its structure. It is comprised of multiple shells.- gaseous layers which once were the star’s atmosphere. As the star aged, its core became unstable and it erupted in unexpected releases of energy – like expansive blisters breaking open. These waves of gas are then illuminated by the ancient star’s ultraviolet radiation, causing it to glow. Each chemical acts as a pigment, resulting in different colors. In the case of IC 1295, the verdant shades are the product of ionised oxygen. However, green isn’t the only color you see here. 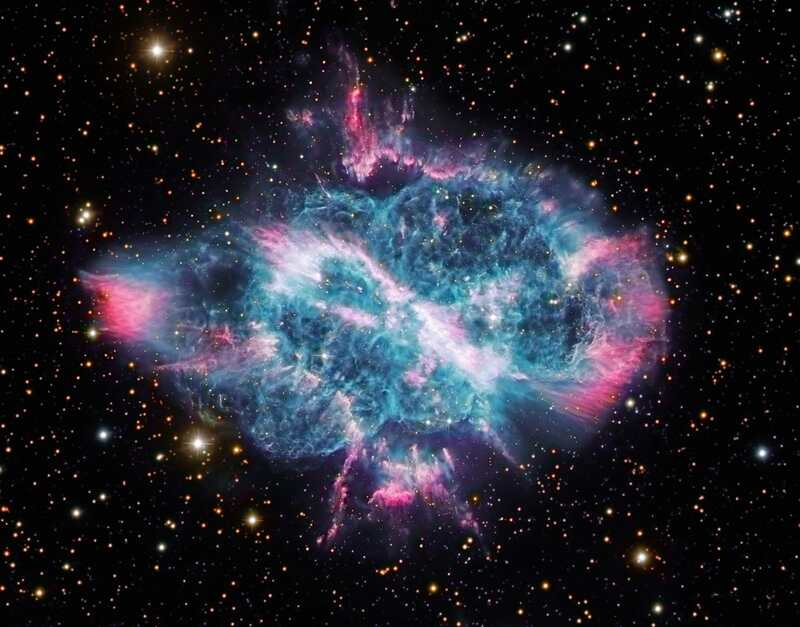 At the heart of this planetary nebula beats a bright, blue-white stellar core. Over the course of billions of years, it will gently cool – becoming a very faint, white dwarf. It’s just all part of the process. Stars similar to the Sun, and up to eight times as large, are all theorized to form planetary nebulae as they extinguish. How long does a planetary nebula last? According to astronomers, it’s a process that could be around 8 to 10 thousand years. Original Story Source: ESO Photo Release. Stretching across three light years of space and located about 3,000 light years away in the direction of the constellation of Musca, an incredible and rather understudied planetary nebula awaits a new hand to bring out new light. While most planetary nebula have a rather normal, bloated star look, NGC 5189 shows an extraordinary amount of loops and curls not normally seen in objects of its type. Just what is going on here? This incredibly detailed image comes from the one and only Robert Gendler and was assembled from three separate data sources. The detail for the nebula is from Hubble Space Telescope data, the background starfield from the Gemini Observatory/AURA and the color data from his own equipment. Here we see fanciful gas clouds with thick clumps decorating them. Intense radiation and gas streams from the central dying star in waves, fashioning out hollows and caves in the enveloping clouds. While these clumps in the clouds may appear as wispy details, each serves as a reminder of just how vast space can be… for each an every one of them is about the same size as our Solar System. And just as incredibly large as some things can be – others can be as small. At the heart of NGC 5189 shines the tiny light of its central star… no bigger than Earth. It wobbles its way through time, rotating rapidly and spewing material into space like a runaway fire hydrant. Astronomers speculate there might be a binary star hidden inside, since usually planetary nebulae of this type have them. However, only one star has been found at the nebula’s center and it might be one very big, very bad wolf. Just why is this celestial tapestry so complicated and complex? The answer isn’t a simple one – it’s one that has many plausible theories. We know that when a star similar to the Sun expends its fuel, it will begin to shed its outer layers… layers which normally take on very basic shape. These “normal” shapes are usually a sphere, sometimes a double lobe and at times it can be a ring or helix. However, NGC 5189 just doesn’t follow rules. Over time, researchers have speculated it has given off different outlfows at different stages – one prominent as a very visible torus situated around mid-point in the structure – consistent with the theory of a binary star system with a precessing symmetry axis. Still, there is clearly more research needed. Is NGC 5189 the handiwork of a binary star? Or is it the product of an intensely hot Wolf-Rayet? Like the proverbial Tootsie Pop equation… the world may never know. Many thanks to Robert Gendler for sharing this incredible image with us. In a 34 minute exposure taken almost a half dozen years ago, the Hubble snapped both life and death combined in an area where all stars were once assumed to be the same age. Globular clusters, as we know, are spherical collections of stars bound by gravity which orbit the halo of many galaxies. At one time, astronomers assumed their member stars were all the same age – forming into their own groups at around the same time the parent galaxy formed. But now, evidence points toward these balls of stars as having their own agenda – and may have evolved independently over the course of several hundreds of million years. What’s more, we’re beginning to learn that globular cluster formation may differ from galaxy to galaxy, too. Why? Chances are they may have encountered additional molecular clouds during their travels which may have triggered another round of star formation. However, it’s not the individual stars which make this Hubble image such a curiosity, it’s the revelation of a planetary nebula. This means a huge disparity in the member star’s ages…. one of up to 300 million years. Is it possible that the shell and remains of this dead star is a line-of-sight phenomenon, or is it truly a cluster member? So what’s wrong with the picture? Apparently nothing. The findings have been studied and studied again for errors and even “contamination” by field stars in relation to NGC1846’s main sequence turn off. It’s simply a bit of a cosmic riddle just waiting for an explanation. Original Story Source: NASA’s Hubble Finds Stellar Life and Death in a Globular Cluster. For Further Reading: A double main-sequence turn-off in the rich star cluster NGC 1846 in the Large Magellanic Cloud, Population Parameters of Intermediate-Age Star Clusters in the Large Magellanic Cloud. I. NGC 1846 and its Wide Main-Sequence Turnoff and Multiple stellar populations in three rich Large Magellanic Cloud star clusters.